The Ball State University Libraries’ GIS Research and Map Collection (GRMC) has created a new map based on the life of Indiana astronaut Virgil “Gus” Grissom in honor of the state’s bicentennial anniversary. The map, First Team: Gus Grissom and the Tragedy of Apollo I, is based on the youth book, Gus Grissom: The Tragedy of Apollo I, by Robert Greenberger (available from the Educational Technology and Resources Collection in the lower level of Bracken Library). 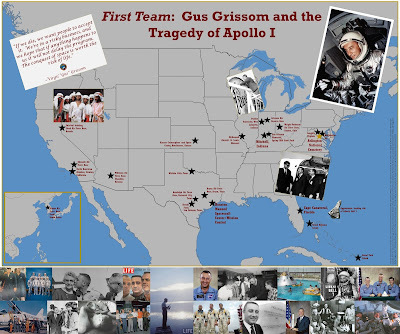 The map includes important locations in the life of Gus Grissom, who was born in Mitchell, Indiana, and attended Purdue University. Grissom was chosen as an original Mercury Seven astronaut in 1959. He was the second American to fly in space and the first astronaut to fly in space twice in both the Mercury and Gemini programs. Grissom was chosen to command the first Apollo mission, but the space module burned during a pre-launch test in January of 1967, killing all three astronauts on the Launchpad in Cape Canaveral (then Cape Kennedy). The map identifies where Grissom was stationed in the Air Force, where the Mercury Seven astronauts experienced survival training, where Grissom’s Liberty Bell 7 space capsule splashed down and sunk off the coast of Florida in 1961, and the locations of the Gus Grissom Memorial and his burial site, Arlington National Cemetery. The Indianapolis Children’s Museum opens a new exhibit on June 25, Beyond Spaceship Earth. This exhibit tells the story of the American space program beginning with Project Mercury and includes an “Indiana Astronaut Wall of Fame,” celebrating the many astronauts and engineers from the state, including Gus Grissom. The new Schaefer Planetarium and Space Object Theater will display Grissom’s Liberty Bell 7 capsule on loan from the Kansas Cosmosphere and Space Center (shown on the map) where the capsule was restored after being recovered in 1999. The exhibit is included with the cost of admission. The Grissom map is available in digital format from the Libraries’ Cardinal Scholar repository, and a paper version of the map may be circulated from the GRMC on the second floor of Bracken Library.